Here are some updates on a series of long term charts I posted last year. 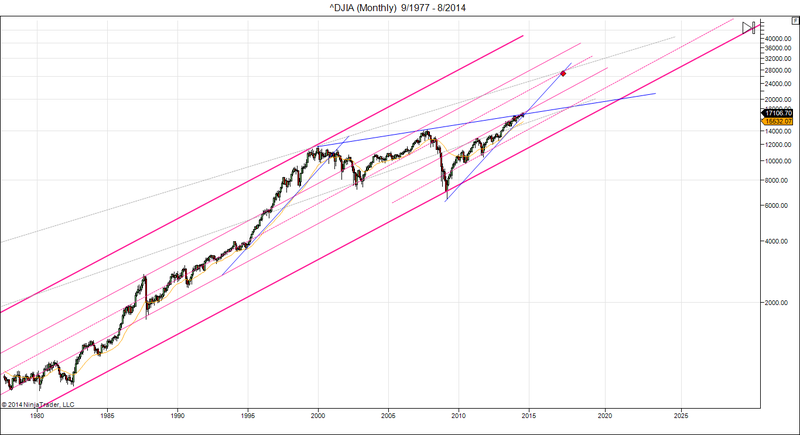 Interestingly the case for Dow 32000 is still alive and kicking. Who would have thought? The Dow has reached the long term overhead resistance line connecting it with the 2000 and 2007 peaks. It has also kept above the trend line that started from the 2009 lows. The market is increasingly squeezed between these two lines, not able to make up its mind where to go next. But we are going to find out soon. 1) The current correction has to be shallow and cannot venture too far below 14000 before recovering. 2) The green overhead resistance line, connecting the 2000 and 2007 highs, will have to be overcome and left behind. That’s not going to be an easy feat. But with all the ongoing QE, who knows? 3) This breakout above 17000 would have to come by summer 2014. So, what next? The breakout above 17000 could still prove to be a false breakout, and that’s what more than a few market observers are calling/hoping for. But I would not rule out the case that this market will simply continue to climb to 20000+ by early next year. Few people are betting on it, the market “needs” a correction, isn’t it? I would rate chances for a further climb at 30%. Another possibility is a drop to ~15000 this autumn, which would break the up trend line since 2009 and clean out “weak hands”, only to rebound and climb to 20000+ in 2015-16. I would rate this a 50% chance. Third possibility is a drop to ~15000 with no buyers showing up and then a further decline to 10000-12000 or lower. I would rate this a 20% chance at the moment. 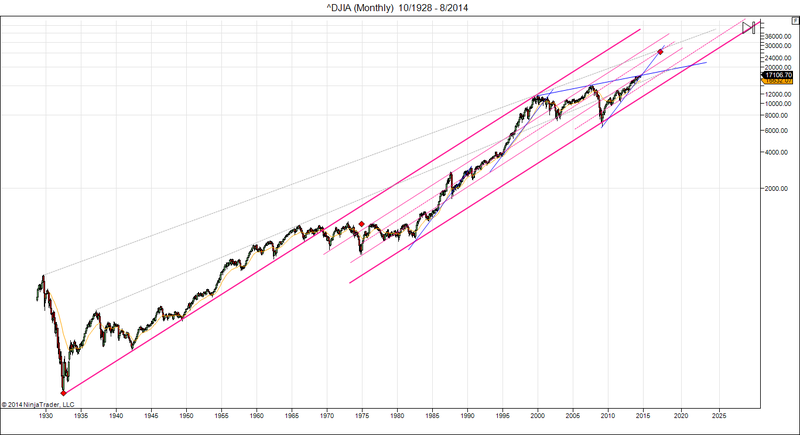 Can we avoid Dow 32000? Martin Armstrong – Sticking To Prediction For Major Dow 32,000! This entry was posted on August 27, 2014 at 12:44 pm	and is filed under Market Commentary. Tagged: Dow 32000, Dow Jones. You can follow any responses to this entry through the RSS 2.0 feed. You can leave a response, or trackback from your own site. This mirrors Martin Armstrong’s ECM Danny. It would likely be foolhardy to rule it out! I just have a simple question. Every market reacts different on moon cycles so why gives the software a general outlook, and not just one outlook for a specific market? Where did you get the idea that every market reacts different on moon cycles? Most stock markets are highly correlated, so they respond pretty much the same to moon cycles.